On July 20th Cabrini Connections and the Tutor/Mentor Connection hosted their 11th Annual Jimmy Biggs Memorial Cabrini Connections Golf Benefit. 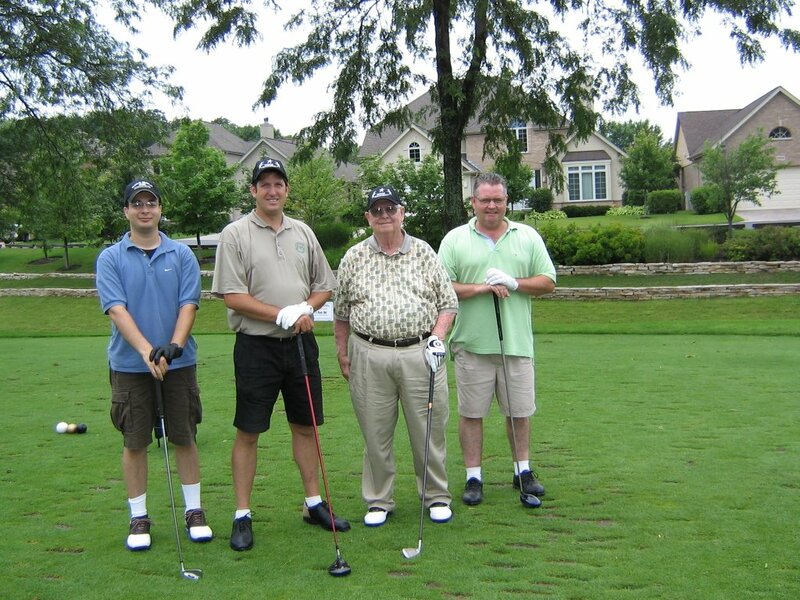 Steve Miller, President of Legacy Mortgage (shown 2nd from left in photo) was the chair. The golf benefit is named in memory of Jimmy Biggs, a youth who participated in Cabrini Connections from elementary school through high school, then joined the staff after he graduated. Jimmy helped create the golf benefit in 1995 and his goal was to recruit 100 CEOs to be leaders and donors who would provide the support to make programs like Cabrini Connections available to more kids in more neighborhoods. Jimmy died suddenly in 2000 before he could realize that dream, but the Golf Benefit keeps the goal alive. You can learn more about the Golf Benefit, and make your own donation, at http://www.cabrinitmcgolf.org . This event, and events like the MY HERO AWARD Lunch, hosted by the Lend A Hand Program, read http://tutormentor.blogspot.com/2006/07/chicagos-legal-community-lending-hand.html , kick of the annual August/September volunteer mobilization campaign led by the Tutor/Mentor Connection. There are thousands of youth who would benefit from tutor/mentor programs and every program in the city is looking for volunteers as school is starting. Visit the Program Locator at http://www.tutormentorconnection.org to see our list of programs. The reality is, there are not enough programs, especially in the South part of the city and the South Suburbs. This is where business leaders need to step forward. With your support of events like the Golf Benefit and the MY HERO Lunch, you can encourage others to get involved, and you can help us build the infrastructure and dollars needed to support programs like Cabrini Connections. If itis to be, it is up to you and me. Visit the Cabrini Blog at http://cabriniblog.blogspot.com/ and see how graduate students from Edgewood College in Madison, Wisconsin are connecting this week with 7th to 12th grade inner city students from Chicago. This is the 7th consecutive year that Edgewood College and Cabrini-Connections students are connecting for a summer workshop. All of the planning, including the work of graduate students to scrounge around for "incentives" like gym shoes donated by a big shoe company. These were the motivation that encouraged the CC students to show up each day at 8am. Hopefully the lessons and relationships will lead to better preparation for school this school year, and in a few years, better preparation to attend college. Visit the blog and read what some of the CC and Edgewood students are saying about this week's collaboration. This is the type of college/community collaboration that could be happening all over the country, connecting students, faculty and alumni of big and small universities with tutor/mentor programs in big cities like Chicago. 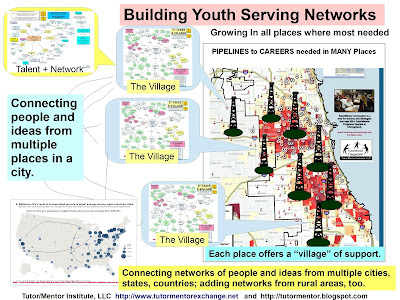 We know that many colleges already do programs like this with individual youth serving organizations and schools. Our aim is to encourage organizers to look at the T/MC Map Gallery at http://webpages.charter.net/jcory17/geotech/tmc_directory.html and think of ways that they could reach more than one programs within a big city. In the T/MC Forum is a discussion of how students from Graduate Business Schools can take a lead in such strategies. 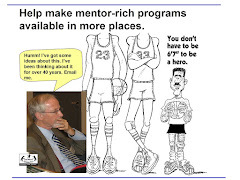 As we head into the coming school year, I hope readers will share this information and encourage more university people to get involved with the Tutor/Mentor Connection. More than 200 lawyers, judges, law firm leaders and tutor/mentor program leaders and students attended the 3rd Annual MY HERO AWARD Luncheon, held July 12 at the Standard Club in Chicago. The purpose was to celebrate the legal community's involvement in Chicago-area volunteer-based tutoring/mentoring programs. The event is hosted by the Abraham Lincoln Marovitz Lend A Hand Program, sponsored by the Chicago Bar Association. The MY HERO AWARD event kicks off the 2006-07 Chicagoland Back to School Tutor/Mentor Volunteer Recruitment Campaign, which aims to mobilize business and professional volunteers to serve in volunteer-based tutor/mentor programs throughout the Chicago region. Visit the Recruitment Campaign section at http://www.tutormentorexchange.net to learn how your company or tutor/mentor program can be part of this campaign. Contact the Tutor/Mentor Connection if you'd like to duplicate this in another city. My criticism was that the plan to create a system of excellent schools did not include a strategy or vision for also creating a system of excellent non-school learning supports, such as comprehensive, volunteer-based tutor/mentor programs. I've been looking for leaders and organizations who were also delivering this message, but with greater visibility and a more national impact than the Tutor/Mentor Connection. I have found such an organization. a pdf titled Promoting a Systematic Focus on Learning Supports to Address Barriers to Learning and Teaching. This is a Policy Brief, provided the UCLA Center for Mental Health in Schools. For those leading non-school tutor/mentor programs who struggle to get attention in a funding environment that focuses so much attention and resources to curriculum, teachers, class size, principles, etc., this is a really important resource. After I read the PDF I followed the links to the UCLA web site at http://smhp.psych.ucla.edu/ Open the What's New section and follow the links to the Student Support Initiative. You'll find a national network and a wealth of resources that I hope you'll put to work in your own communities, and which I hope will lead to greater support for comprehensive, long-term, volunteer-based tutor/mentor programs. School starts in less than 8 weeks and for most inner-city kids, the supports they need won't be in place because there are too few leaders with a vision and a strategy. However, if you're interested in supporting volunteer-based tutoring/mentoring, in Chicago, or in any other city, we can help you find places where you can be a volunteer, donor and/or leader. While we may not be able to put the entire infrastructure of learning supports in place by September, we can connect hundreds of additional volunteers with inner city kids, and we can make a dramatic change in the cash flow of individual organizations. That can make a quantum difference for many kids in cities throughout the country.